I’m happy to announce that we have many changes being moved live today. There have been a number of changes to your Profile pages, mostly moving items into a single location for anything Social Market related. 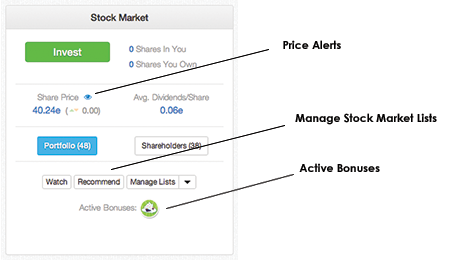 If a person has purchased any shares recently (within the last 30 days), the time of the last transaction will also appear in this box. We are happy to also announce a new addition to your Profile page — the “Follow” button. Under everyone’s profile picture you will see a new “Follow” button. Following on Empire Avenue means that you will be following the Missions that they create. 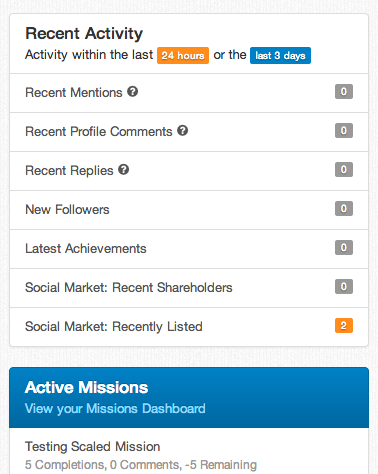 Missions from people you Follow will appear on your Empire Avenue Home Page. This is the first page you normally land on when you login to Empire Avenue. There are a number of changes to this page. “Highlighted Missions” have been changed to be Missions from people that you follow plus those matching your Interests & Networks. The right side of the page has been changed over to a dashboard with some of the most used notifications and places. If you are creating Missions you will be able to see your current active Missions listed with some quick details so you can manage them. We’ve added a profile completeness bar and new Getting Started Missions which are special Missions aimed at new users to complete their profile. For existing users, if there are some items not completed, well, you can go complete them now or whenever! Please help us educate our new users on Empire Avenue. When you start on Empire Avenue from today, a new user will not receive any Eaves. They must complete special Getting Started Missions that are visible on their Empire Avenue Home Page which will allow them to accumulate Eaves. We have moved Lists, such as Recommended, Watching etc. to be in the Social Market area. These lists were for people to manage their Social Market trading and hence they should be logically grouped in that section. In preparation for other changes, Recent Arrivals has been renamed to Recently Listed and now appears in the Social Market area of the service. Have any comments on the new layout/features? Head on over to the Empire Avenue General Discussion Community to voice your opinion!